Lounging with a Latte: Out with the spray paint! 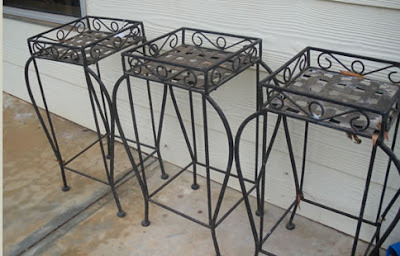 You might remember a couple of weeks back I showed you some wrought iron pot stands that I purchased from a garage sale for $15. Anyway, here they are again. 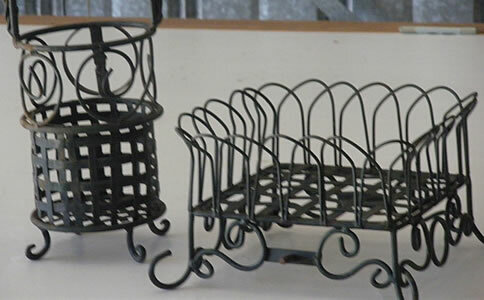 Yesterday at another garage sale I picked up a wrought iron wine bottle holder and serviette holder for $2. Today was the perfect sunny day, to get the spray paint out and go to work on them. Here is the finished product for the stands. 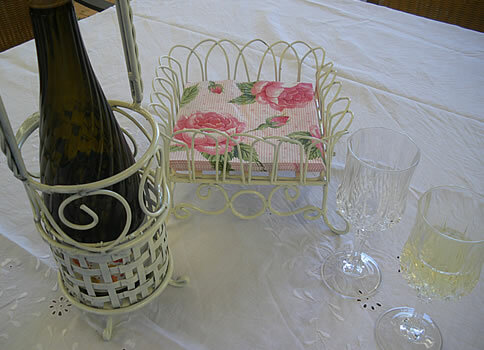 And here is the wine holder and serviette holder...just waiting for someone to join me for a wine!!! Excuse the unironed table cloth...the cloth was another item I purchased a while back at an op shop. It had a few stains on it, but I soaked it in Sard Wonder powder they came out, so it's like new...just a pain to iron as it's 100% cotton! You may wonder where the 3rd pot stand is? I ran out of spray paint, so that will have to wait until next time!! 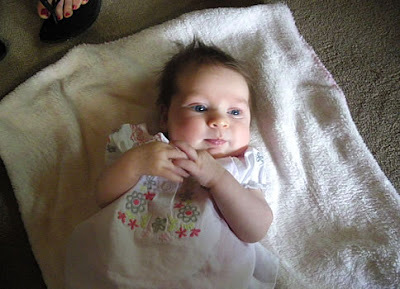 We had friends over for a bbq yesterday to watch the AFL grand final and amongst those friends was an 8 week old little girl...had lots of cuddles...she's so cute! 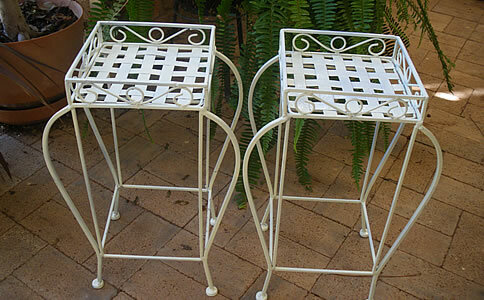 What a cute little poppet, and those wrought iron pieces have come up great. Well done. Wow Netty your wrought iron stuff looks great and a couple more bargains there. Awww Mels little girl is soooo cute. wow - what bargains, love the paint job..... you little bargain hunter. Gorgeous! I love them in white! Annette, you are a clearly a woman after my own heart! When doesn't a quick spray paint work wonders? Thanks for visiting my blog. Hope you have a great week. Love what you did with your garage sale finds,hope you get some more paint to finish the job of. It's amazing what a lick (or a spray) of paint can do. If you iron your cotton tablecloths etc while they are still damp they are much easier to iron.